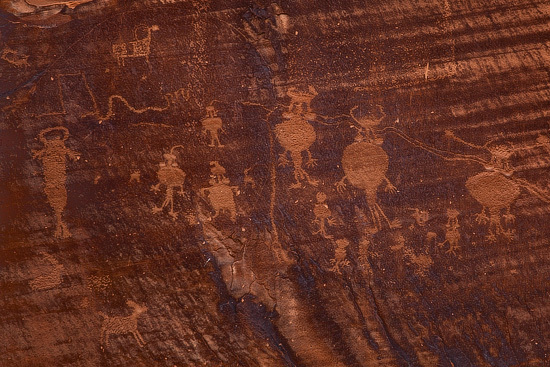 One of the rock art sites is located just next to Moab (14 km) along the Route 279, also known as Byway 279 or Potash Road according to some maps. 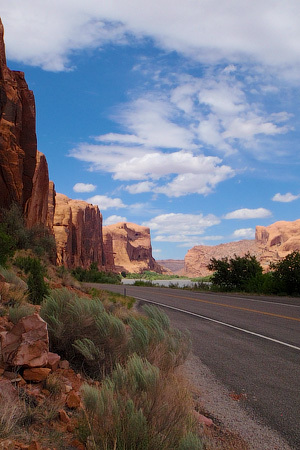 Rock art sites along this road are clearly marked and have small pockets where you can leave your car while exploring the ancient drawings. Engravings can be found on the cliff walls next to the road about 6 meters above the ground. While it doesn’t make them convenient to observe, the distance from the road keeps engravings untouched and saves from vandalism. 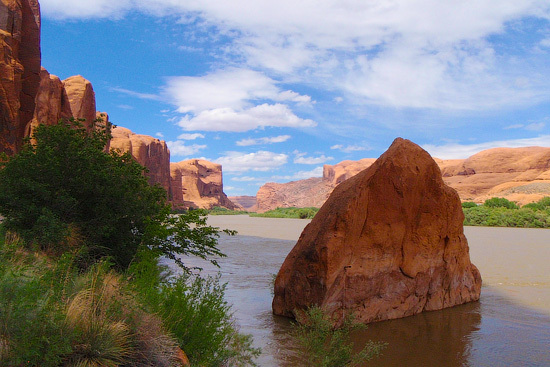 So, if these engravings are 6 meters above the ground, how native Americans could carve them? Were they three times taller then us? Don’t think so – I believe that engravings were easily accessible before the road was constructed and cliff slope was cleared away. 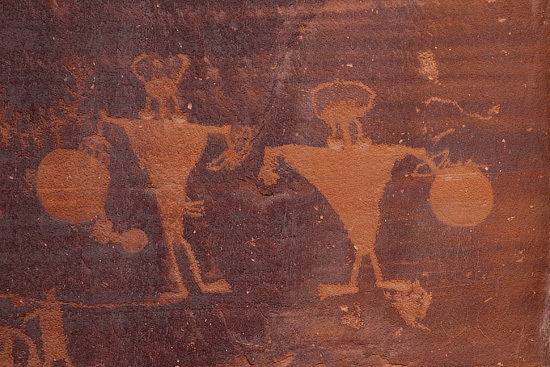 Officially these engravings are called petroglyphs. 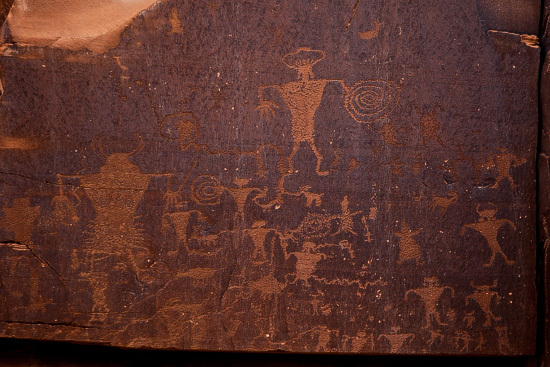 According to wikipedia, petroglyph is an “image created by removing part of a rock surface by incising, pecking, carving, and abrading”. The word “petroglyph” is a combination of two Greek words – petros (“stone”) and glyphein (“to carve”). How old are they? Unfortunately there is no definitive answer. 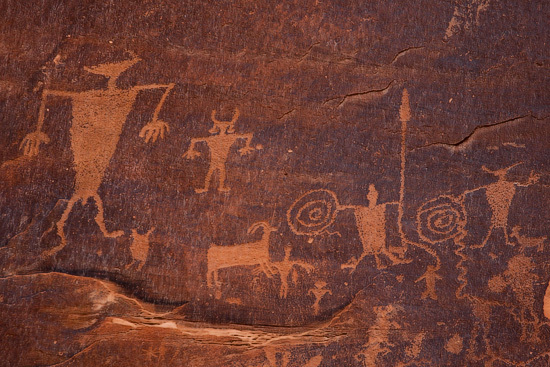 While all petroglyphs have “similar” style they could be made by different cultures anytime between 1 A.D. and 1880 A.D. 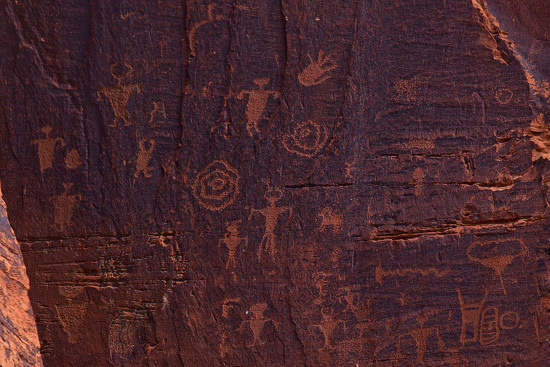 The only way to establish an approximate age is to look at particular petroglyph, identify what is shows and refer to the history of the region. 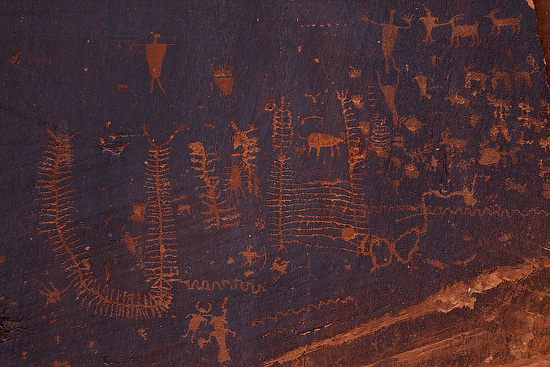 For example, it is presumed that bow and arrows appeared in this region after A.D. 500, so petroglyphs showing them will be about 1500 years old. 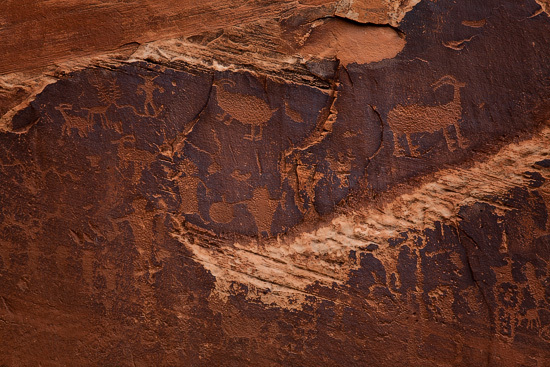 Unfortunately, some engravings can be dated with better accuracy – in many places next to petroglyps panels, you will see examples of modern designs left by vandals. 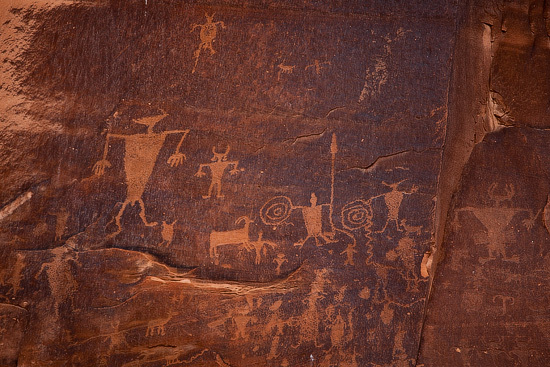 Please don’t leave your own, instead compare modern examples with original rock art and notice that older petroglyphs stay far ahead with its’ diversity, details and story.